Is That A White Phlox Blooming in Summer? 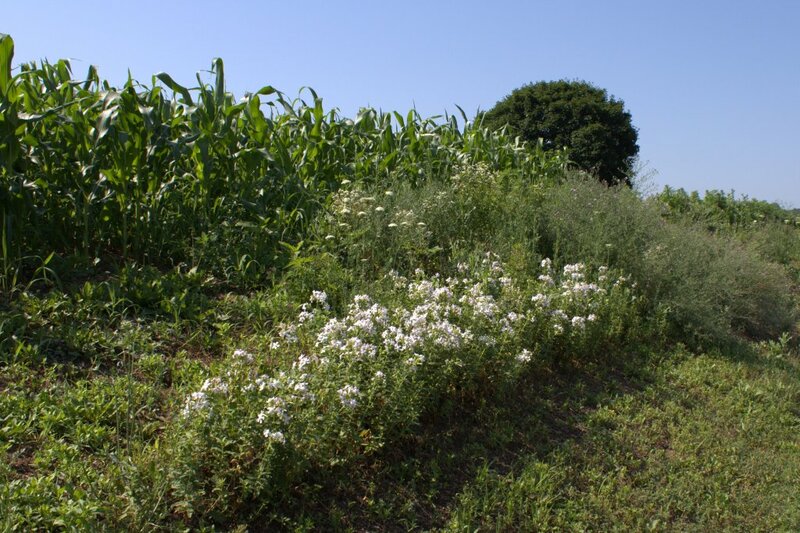 The other day I was driving over to an Amish woman’s vegetable stand when I spotted this group of plants that looked like a small version of phlox blooming in white at the edge of a corn field. How could a phlox be blooming in the heat of summer? I thought phlox was strictly a spring-blooming plant, so of course I had to stop to look a bit closer and find out what these pretty white flowers were. Bouncing Bet flowering next to a country road near a cornfield. Bouncing Bet has been introduced in North America and is native to Europe. It can be found across the United States in waste places and in great masses along roads and at the edges of fields. Read moreIs That A White Phlox Blooming in Summer? With a name like ‘Indian Hemp’ somebody might think this common plant is smokable. Well, it isn’t. In fact the stuff is toxic to ingest in any form and may cause cardiac arrest! Indian Hemp was found growing in the same location as wild parsnips. Indian hemp growing at the edge of a country road. Flowers, leaves and stems are distinctive in the weedy Indian Hemp. Many Internet resources – and I use that term lightly – have confused Indian Hemp or Indianhemp, Apocynum cannabinum, with smokable hemp or Marijuana, Cannabis sativa. Somes sites use the term interchangeably as if they were the same plant. These two plants are not related and the only thing they have in common is that they can be used for fiber. “Indian hemp” may also be a common name used for Cannabis indica or the sub-species indica of Cannabis sativa. 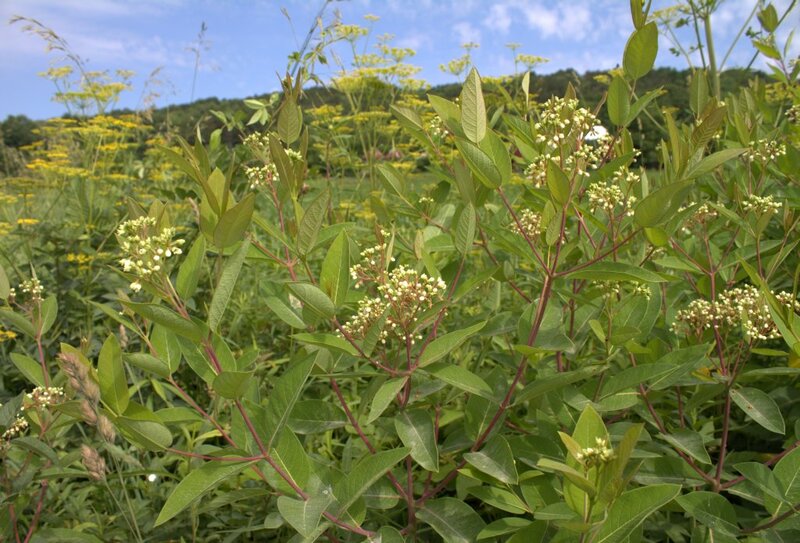 Indian Hemp that we’re talking about is a member of the Dogbane family, Apocynaceae, and may also be commonly known as dogbane, common dogbane or hemp dogbane. The genus name Apocynum literally means “poisonous to dogs”, so even the name of the plant is telling us to beware. Once you see what a dill weed plant looks like in flower, you’ll easily recognize other related plants as being members of the same family because of their flowering umbels. The Carrot Family, Apiaceae, may also be referred to as the Umbelliferae or parsley family which contains several edible plants. The flowers of Carrot Family members grow in umbels or compound umbels. 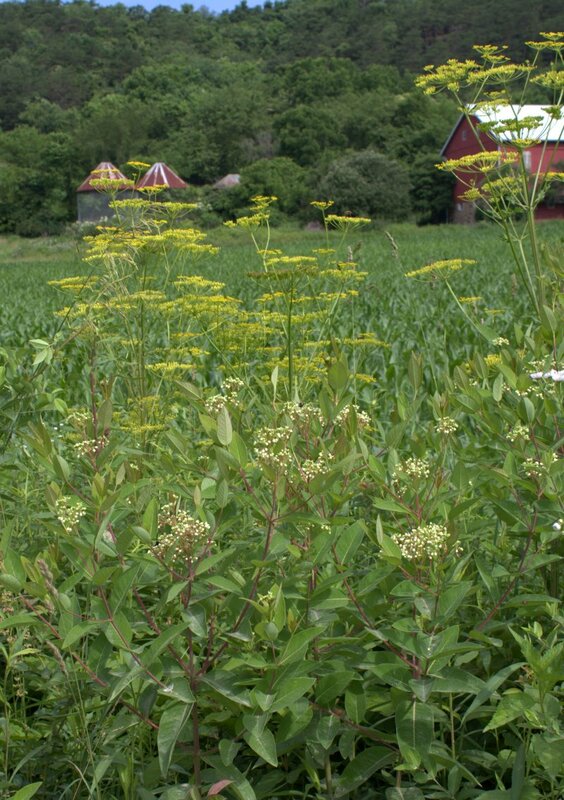 Umbels contain groups of tiny flowers that have their flower stems emanating from a single point. 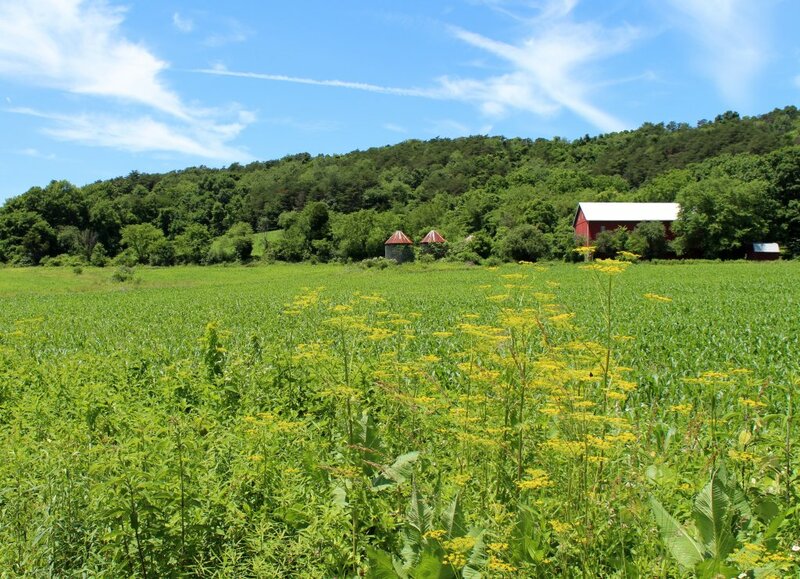 Wild parsnip, Pastinaca sativa, is a Carrot Family member that is not native to America that also flowers in umbels. It can be found growing tall at the edges of fields and on the side of the road in sunny locations. It will grow 2 to 5 feet tall and is found throughout the eastern U.S. in waste places, according to Peterson’s Wildflowers Field Guide . Wild parsnips growing at the edge of a corn field where it meets a country road. The foliage of this alien plant is made up of compound leaves attached alternately to a thick, ridged main stem. We grow the usual garden plants, including a few varieties of tomatoes, hot and sweet peppers, ground cherries, peas, beans, cucumbers, garlic, lettuces, radishes, carrots and many herbs. This year we added into the mix the tomatillo. If it weren’t for the Tomato Family, we would have a garden half as big. The tomatoes, peppers, ground cherries and tomatillos are all members of this family. We plant seedlings or seeds for many of the vegetables that we want to grow. In addition to planting known veggies, we allow certain ones that re-seed themselves to come up again. Lettuces, cherry tomatoes, and ground cherries are the common re-seeders. The only problem with this method is that the garden can quickly become overgrown if the volunteers are not thinned out vigorously. We learned that last year. This year a new problem cropped up. A weedy plant was left to grow in the vegetable garden presumably because of its mistaken identity. We’re pretty good at pulling weeds and mulching to keep the weeds from overtaking the garden, but somehow this one weed was left to grow too big. It turns out that the leaves of this alien plant look a lot like the leaves of the ground cherry. It was hiding under a cherry tomato, and when that was staked up the odd plant was finally noticed. Once detected, it was left to grow a while just for observation. It was pulled out before the fruit was dropped, so hopefully next year we won’t have a garden full. 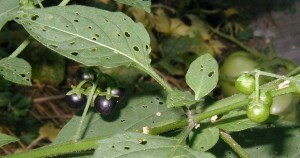 The alien plant in question was the deadly Common Nightshade, Solanum nigrum. It’s a member of the Tomato family or the Nightshade family, Solanaceae. Other family members include plants that give edible fruits, such as the tomato, potato, ground cherry, bell pepper, chili pepper and eggplant. Tobacco is another useful family member. Common nightshade hiding among the cherry tomatoes. Photo taken 25 July 2011. Being in the tomato family suggests some similarity between these plants. Common Solanum characteristics include the flower shape with five petals that are often reflexed backwards, yellow stamens that form a beak around the central pistil, and somewhat triangular-shaped leaves. Bug-bitten leaves of nightshade and five-petaled white flowers. Photo taken 17 August 2011. Tomatoes, ground cherries and tomatillos are similar to the common nightshade. 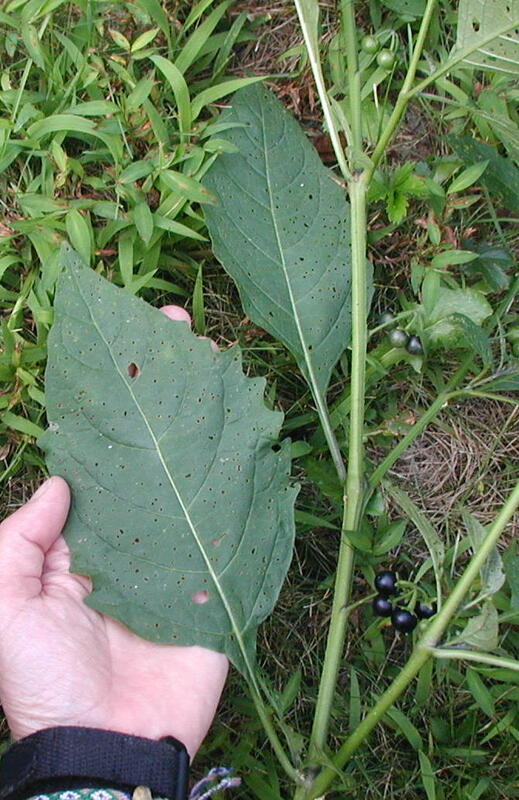 It seemed a little odd that the nightshade leaves were full of holes whereas the others were not. 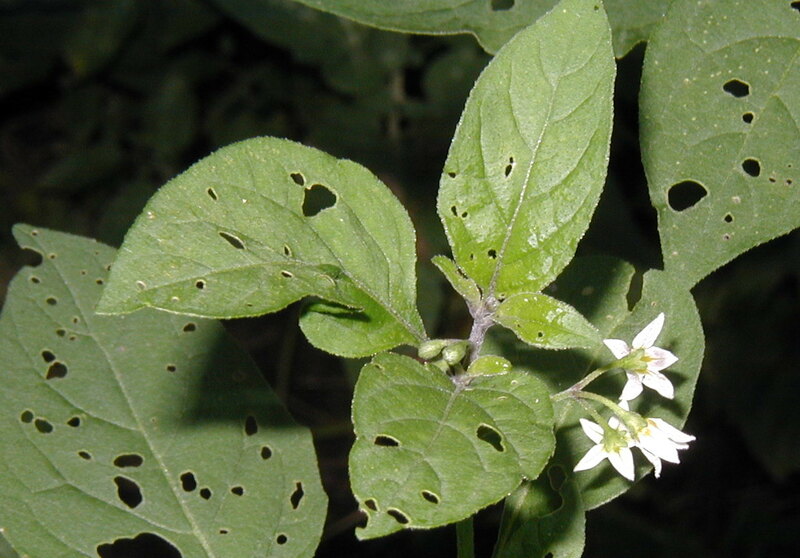 Of course they all had insect damage, but the small roundish holes in the nightshade leaves weren’t seen as much in the other tomato relatives. 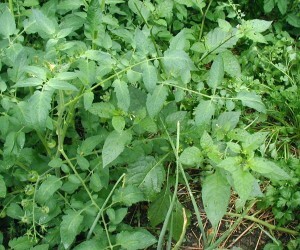 Large lower leaves of Common Nightshade. 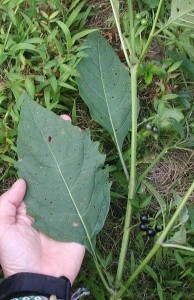 Note the black or green berry clusters that arise in between leaves right from the main stem. Photo taken 17 August 2011. 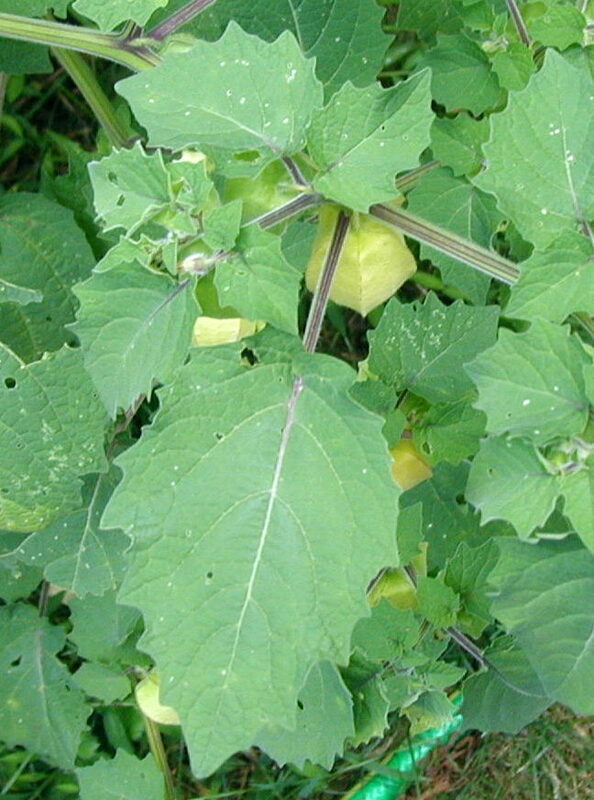 Leaves of the ground cherry plant look similar to the leaves of nightshade. Photo taken 25 August 2011. 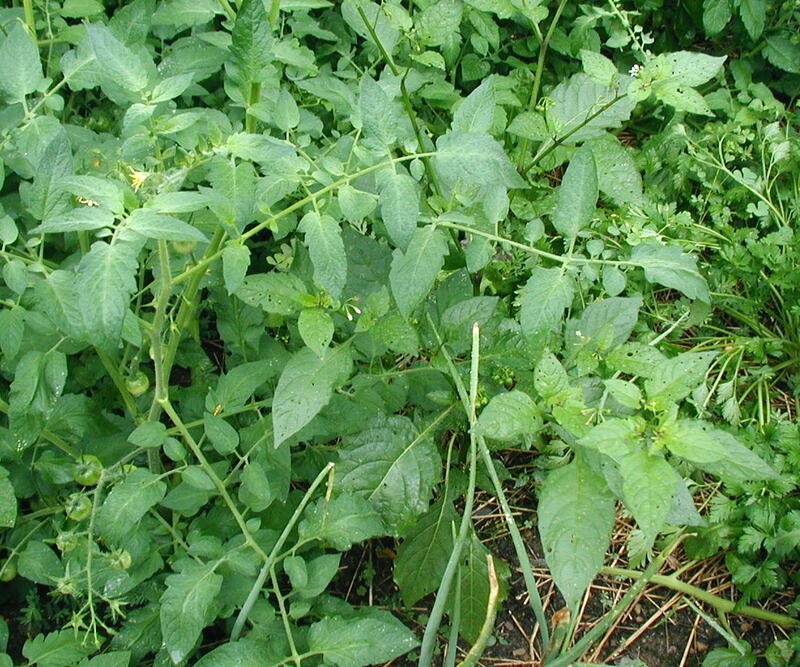 Common places to find this nightshade are disturbed areas, waste ground and cultivated grounds, such as found in the vegetable garden. We probably have birds to thank for dropping seeds wherever they go. Green and black berries of Common Nightshade. Note the five, star-like sepals of the berries. Photo taken 17 August 2011. DO NOT INGEST NIGHTSHADE BERRIES OR ANY PLANT PART! A chemical called solanine is found in all parts of the plant and it is toxic. See comments below. A plant that strikes terror in some who have fallen victim to its skin-eruptive oils is Poison Ivy, Rhus radicans. It’s surprising how many people don’t know what poison ivy looks like. We always point it out when berry picking or taking a hike in the woods. People should know not to come into contact with those three leaves. A poison ivy rash is something to be avoided at all times. Worse than an insect bite, poison ivy rashes can spread when the affected area is scratched. Pustules can break open and release liquids which easily spreads the plant’s oils that blister the skin. TIP: Do everything you can to not scratch the itchy, reddened blotches for your rash to go away the fastest. Wash contaminated clothing before re-wearing. What does Poison Ivy look like? A popular saying to remind one what it looks like is, “Leaflets in three, let them be”. 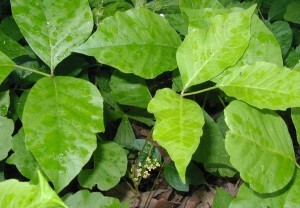 Poison ivy is a vine that often grows along trails and areas at the edges of forests. It may grow from underground roots or from runners along the ground and up into the trees. Look for hairy roots on vines that can be several inches in diameter which have grown up the trunks of large trees. Poison Ivy leaflets in three can be seen to the left of Wild Geranium in bloom. Photo taken 29 May 2011. 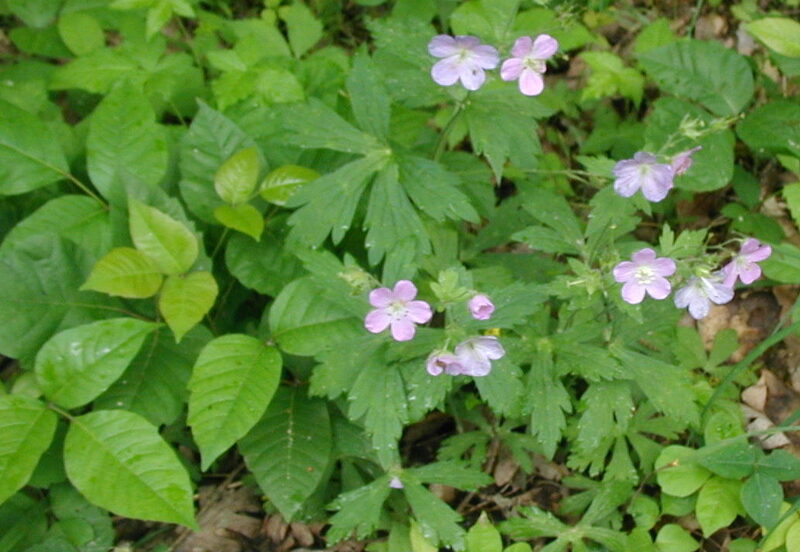 Two triplicate leaves can be seen in the below image. Each leaf is a palmately compound leaf, meaning that one leaf consists of a long stem plus the three leaflets. Flower clusters arise where the two leaf stalks meet at the main stem. Two Poison Ivy leaves in threes lie on either side of a cluster of flowers. The flowers of poison ivy may be seen on mature plants as clusters of orange and light green blossoms that occur in the leaf axils. Petals are light green to whitish and the stamens are orange. Flower cluster showing orange stamens and light green flower petals. 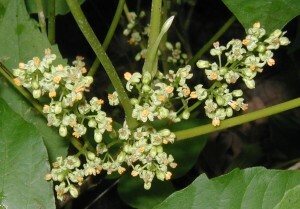 Flowers develop into white berries during the summer. Birds and small mammals eat them. People should avoid them as they are poisonous to the touch from all parts of the plant, including the leaves, flowers and berries.